I am NOT trying to be disrespectful, but last night, the night of the celebration of Martin Luther King Jr.’s Birthday, I HAD A DREAM. It was a dream of vertical space. Vertical space for cats, vertical space for me was what I saw. The only problem is this dream was in German so I did not understand one “cat darn’ thing that was being said. The cool thing is my ghost writer has some funky CAT-A-leptic FELINE-tropic technology that allowed her to convert it into a You-tube video. 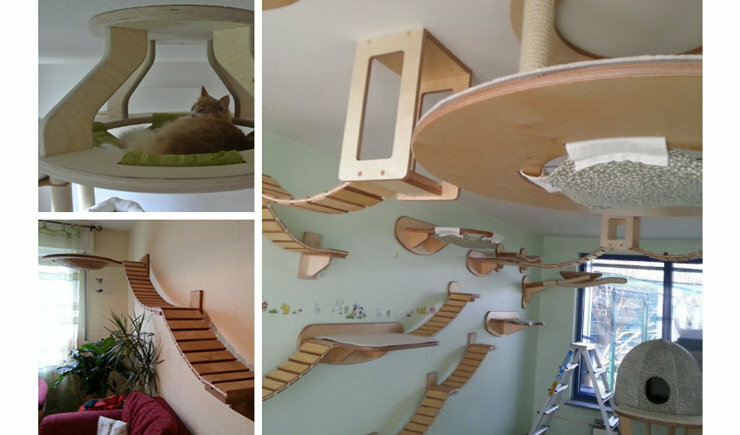 As you can see, this dream showed soft hammocky cat beds, limitless cat walks and platforms and cat suspension bridges and really awesome cat trees; rope wrapped cat branches and trees. Call it cat nirvana or cat heaven, call it what ever you please but call some one and find out how I can have one in “MY” New West Slope Animal Shelter. The end product does not have to be like the one depicted in my dream it just has to function like it, with disinfectable surfaces and lots of separate washable napping stations and routes to get between them. A fish tank or two for me to supervise and agitate would also be a nice addition. Anyway think about it and let’s see what my fans can do. OK?? ?